With a vision extending far beyond serving shareholders, the Royal Australian Air Force Association, known as RAAFA, is a not-for-profit organisation which holds its members as paramount. 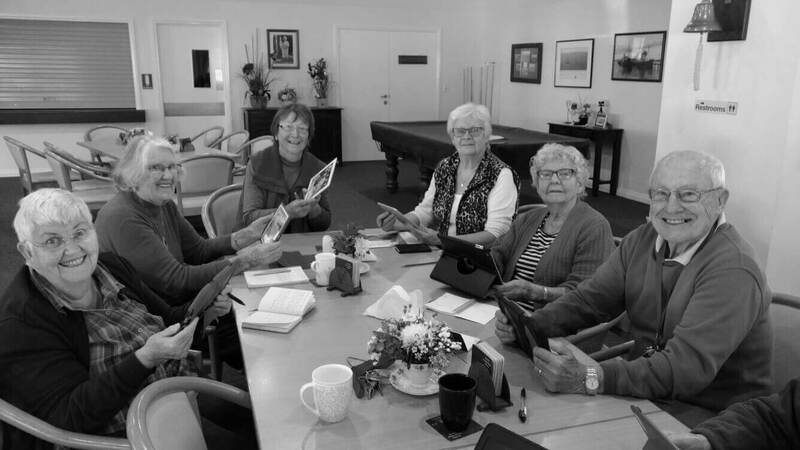 Built on trust solidified by their track record, this group has become the most significant retirement living and aged care provider in Western Australia. Looking after six retirement villages, 19 assisted living units, 446 residential care places and 14 short-stay units, they support members and veterans through welfare and homecare programs. Macquarie Telecom and RAAFA have a long history dating back to 2001, first starting with voice services. With their remote locations suffering at the hands of unusable broadband and frequent downtime, the offering has now evolved to include MPLS, SIP, mobiles, SD-WAN and managed routers. In the smaller country sites of Erskine and Albany, the battle of meagre bandwidth had become incapacitating. With painfully sluggish connections, RAAFA couldn’t grow, successfully implement new business systems, or effectively run CCTV on top of their security and financial systems. Relying on antiquated ADSL with speeds of 4Mbps, momentum was marred by video and voice dropouts, as well as crippling downtime. ‘Everyone was getting calls from me on the weekend because we’d have sites down for three or four days due to the ISDN repeatedly going down on the copper.’ says Craig Burkett, General Manager – ICT at RAAFA. Macquarie Telecom provided RAAFA with SD-WAN in two of their facilities. To stop the tyranny of delay, we installed SD-WAN which uses Multi-Path Technology to merge multiple links to achieve fastest-possible network speeds. With the option to use links from multiple carriers, this not-for-profit has gained superior access to their business systems and produced near-zero downtime. With the central system in Perth, and all invoicing and financials carried out remotely, SD-WAN has allowed for a functional system minus the lengthy delays, long waits to access documents and lags or dropouts. Because Macquarie Telecom’s SD-WAN effortlessly integrates with existing networks, it’s an obvious choice for delivering speed and reliability to inaccessible and remote sites. Our solutions are game-changing for businesses with multiple locations, different network issues, and basic ADSL links. Because Macquarie Telecom was able to install fibre where others couldn’t, SIP is now in situ; surpassing expectations with zero outages. RAAFA’s network and problem sites are now under control, and with 4-5 times the bandwidth, Citrix is redundant. Because SD-WAN can simultaneously use up to four access links, from NBN to ADSL and 4G, it facilitates faster connection. On top of this, RAAFA can now identify and act on apps that are draining bandwidth. With a stable network in place, RAAFA can shift their focus from bandwidth to broader business. Being a not-for-profit, their IT resources are limited, so they look to their partners to provide management and services. Putting our heads together, we’re planning how RAAFA can harness technology to make smarter decisions. With people staying at home for longer in life, it comes down to an efficient SD-WAN network to boost the bandwidth and activate more services to keep them there. 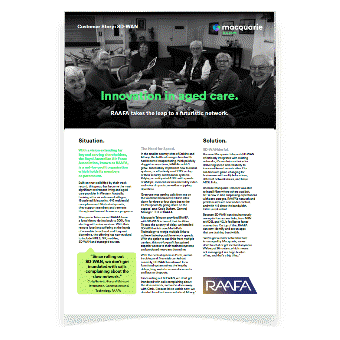 On a macro business level, it’s about supporting people who choose to stay at home and attracting residents to the RAAFA’s retirement living estates by offering smart solutions. With an SD-WAN network in place, the transition of sites from legacy services to NBN services is materially simplified allowing RAAFA to stay focused on what matters. Now that the network is under control, RAAFA can turn their attention toward innovation and rolling out pilot sites trialing the Internet of Things in their estates. This means smarter ways to monitor residents’ daily activities by installing Bluetooth-connected beds, floor mats and smart sensors. Remote sites now see near zero down-time, even with antiquated ADSL. Ability to identify and act on bandwidth draining apps choking the network. Network now supports the rollout of IOT solutions to residents. Transition from legacy services to NBN is now materially simplified. A network that keeps up with SaaS and cloud. Fast, simple rollout for new locations. A hybrid network for problem sites. Remote visibility and control of the whole network. How Macquarie Telecom SD-WAN helps RAAFA take the leap to a futuristic network. RAAFA had a network that was causing them problems. They needed some innovation to turn this around and provide them with a more stable network, so that they could shift their focus from bandwidth to technology. "Because we’ve got a more efficient network, including turning around two problem sites, we’ve now got bandwidth to move our systems into the cloud."